Dorian is like any other scale - it has it's own melodic flavour and can be played over chords and certain progressions. This lesson will not only show you the essential patterns and theory for playing Dorian, but you'll also learn, through the aid of ear training audio and backing tracks, when it sounds good to use. Before you start with the presentation below, make sure you have a basic knowledge of the major scale (as Dorian is one of its modes). First, get to know the intervals of Dorian. These are the building blocks that give Dorian its unique sound. Next, the roadmap. 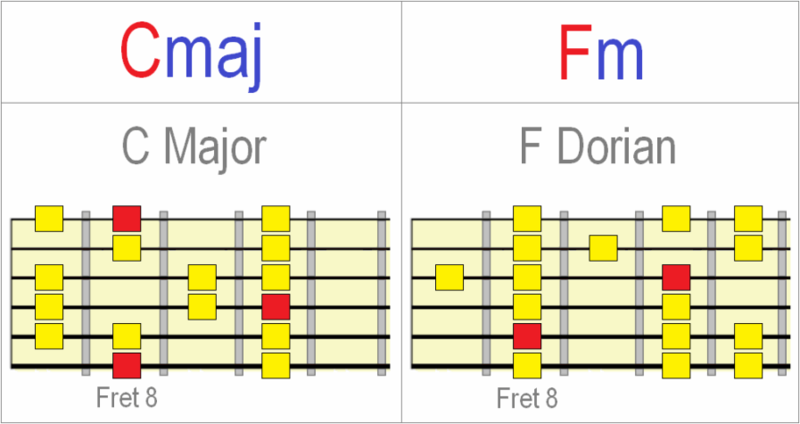 This shows us how the intervals of Dorian appear on the guitar fretboard. Let's start with two main patterns - one built around an E string root, the other around an A string root. As Dorian is the 2nd mode of the major scale, you can also use your knowledge of the major scale's patterns to cover more of the fretboard. 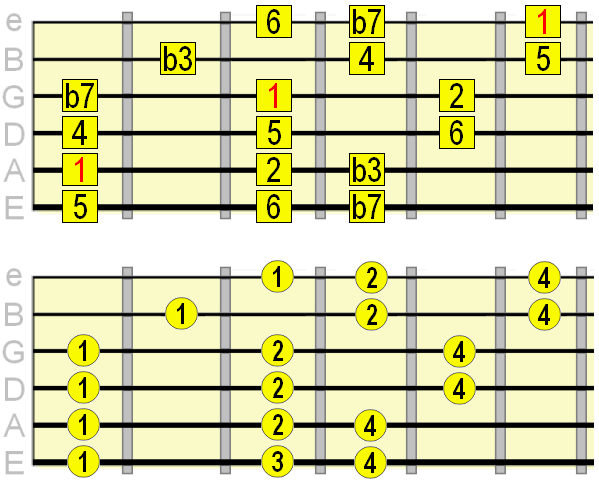 To do this, simply visualise your major scale root one whole step (or two frets) down from the Dorian root. For example, D Dorian uses the same notes as C major. A Dorian uses the same notes as G major. This way, you only have to spend time learning one scale (the major scale) across the entire fretboard and you'll automatically know its seven modes starting from their related major scale degrees (e.g. 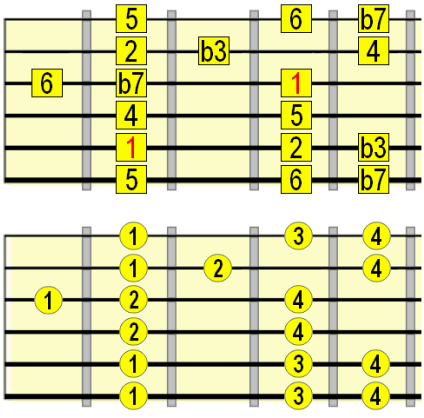 2nd mode Dorian's root is the major scale's 2nd note). 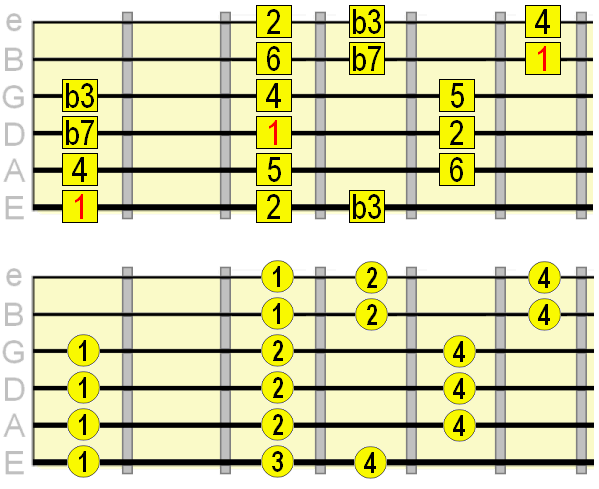 To begin with, have a play around with the scale over the D minor chord track below. Try targeting (lead up to, emphasise) different notes in the scale, such as the minor 3rd (♭3), major 2nd (2) and major 6th (6). These are the "colour tones" of the scale. Tip: remember, where there's Dorian, there's also minor pentatonic and the blues minor scale. Try mixing your Dorian phrases/licks with minor pentatonic. Oops. Your browser doesn't support native audio. Download the track using the link above. 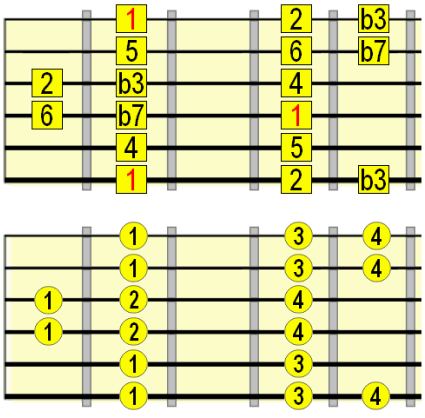 As mentioned in the video, another example of using Dorian is over a minor iv chord. So, in short, Dorian will work over pretty much any instance of a minor chord. Remember that! Dorian also has a modal function, which basically means we can use one Dorian root pattern over a sequence of related chords. We might call these "Dorian chord progressions". Although composers typically do not set out to write modal music (as this would be creatively limiting), modal sequences often naturally occur in music simply because they sound good and meaningful melody/harmony can be easily extracted from them. Dorian has a unique attraction, because of its rather cold and distant quality. The "center" of any Dorian based progression can be identified as the ii chord in major scale harmony (hence, 2nd mode). This is because if we build a chord on the major scale's 2nd degree, we get a minor triad with a major 6th. Therefore, I find it easiest to label the "Dorian chord" as the ii chord. In C major, that would be Dm. In F major, Gm. In A major, Bm. So the ii chord always exists one whole step from the I of its parent major scale (1 w 2). Confused? The best way to understand is to hear it! Here are some common Dorian progressions with backing tracks for you to practice with. G7 Oops. Your browser doesn't support native audio. Download it here instead. D7 Oops. Your browser doesn't support native audio. Download it here instead. A common extension of the ii - V movement. Example: Mansun - She Makes My Nose Bleed. Another variation on ii - V. Example: Alice in Chains - Down in a Hole. You'll often hear that whole step minor chord movement between the ii and iii chord. Tip: be careful over that iii chord. Try to avoid, or at least don't hang around on Dorian's ♭3 over this chord. You'll hear why if you try it. There's a reason for this which I won't bore you with right now! 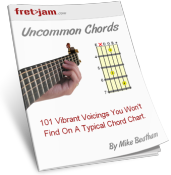 Similar to the previous movement, but this time the V chord is typically extended to an 11th chord. Has a kind of jazzy/soulful feel to it. Example: Doves - Black and White Town. Em7 G11 Oops. Your browser doesn't support native audio. Download it here instead. Bm7 D11 Oops. Your browser doesn't support native audio. Download it here instead. Example: the intro to Al Green's Let's Stay Together. Fmaj7 Oops. Your browser doesn't support native audio. Download it here instead. Cmaj7 Oops. Your browser doesn't support native audio. Download it here instead. Hopefully, by spending time practicing over these progressions, you'll develop an ear for that "Dorian sound". You'll be ready for it! You can learn more about exploring modes using this "fixed bass" technique in my modes ear training lesson. It's a great way to train your ear to the distinction between Dorian and other modes. Thanks for sticking this through to the end. I hope you enjoy exploring this beautiful scale and applying it to your own music!